Ben and Mark visit the Cybermen's favourite pub to discuss The Next Doctor before wandering over to Soho to celebrate Tom Baker's debut in Robot. But before all that, there's the small matters of a new companion and an exhibition of Target artwork to discuss! In this episode: Ben attempts to slaughter a sacred cow, can Mark salvage The Five Doctors and present all the good that it has to offer? Also this week: Why Christopher Eccleston and Tom Baker don't owe you a damned thing. Ben and Mark reach Midnight in their Nu-Who Watchthrough Pairing it up with another tale of evil beings in paradise; Kinda, the conversation takes in a wide variety of topics including; air travel, fear and paranoia, Donald Trump, colonialism and ITV's drama output of the 1990s. Ben, Mark and host of the Televigion podcast; James Myles get themselves into a timey wimey tangle whilst discussing the first appearance of River Song before they've seen her last outing but also after you've seen it. Paired up with Silence in the Library/Forest of the Dead is The Mind Robber, a story that has special resonance for all three Lash Lads. All change in the present day as Steven Moffat hands over to Chris Chibnall. Ben and Mark discuss their reactions to the news and the possibilities the future holds. Meanwhile, in the past, we continue our Series 4 watch through with The Unicorn and Wasp and pair it up with Terror of the Vervoids as we look at Agatha Christie's influence on Doctor Who. Coming out on Hogmanay like the lesser loved BBC panel game Christmas special it's On the Time Lash! Ben and Mark make a Christmas wish come true for their Twitter pal @thepolisbox by inviting him along to discuss Doctor Who gifts, The Husbands of River Song, The Feast of Steven and 2015 in Who. Ben and Mark return from a short Series 9-centric break to discuss The Doctor's Daughter and Galaxy 4. Does Stephen Greenhorn fundamentally change the character of the Doctor? What is it about one shot characters that inspire such a desire to see them return? Just how many references to The Zygon Inversion can Mark cram in? Also: An ode to those wonderful people who bring us reconstructed Doctor Who stories. And so, Series 9 comes to an end. Is Hell Bent the satisfying finale that the series so richly deserves? Mark certainly seems to think so, Ben is less sure. They discuss it in their usual fashion, coming to some interesting conclusions on the relative merits of how our modern day showrunners deal with finales and the portrayal of emotion. We also ponder what could possibly be next for Steven Moffat now that he's "been persuaded to stay". Ben and Mark are stalked by a veiled, grey figure which is more likely to be Visage playing from the pub's sound system. Picking up some of the threads left dangling by Face the Raven, we continue our discussion of death and grief in Doctor Who with a look at Heaven Sent. Is it the most horrific Doctor Who in a very long time? How far in advance did the production team know about this year's time slot? All this and more under discussion in another exciting episode of On the Time Lash! Discussing The Sontaran Stratagem/The Poison Sky and partnering it up with The Invasion in a UNIT special! In another of their Series 9 podcasts, Ben and Mark discuss Under the Lake/Before the Flood. Also under discussion: Class, the ratings and The War Doctor audios. In a look at The Fires of Pompeii and The Aztecs, Ben and Mark discuss rewriting history, the statute of limitations on joking about catastrophic human tragedy and whether or not William Hartnell was the first of the romantic Doctors. 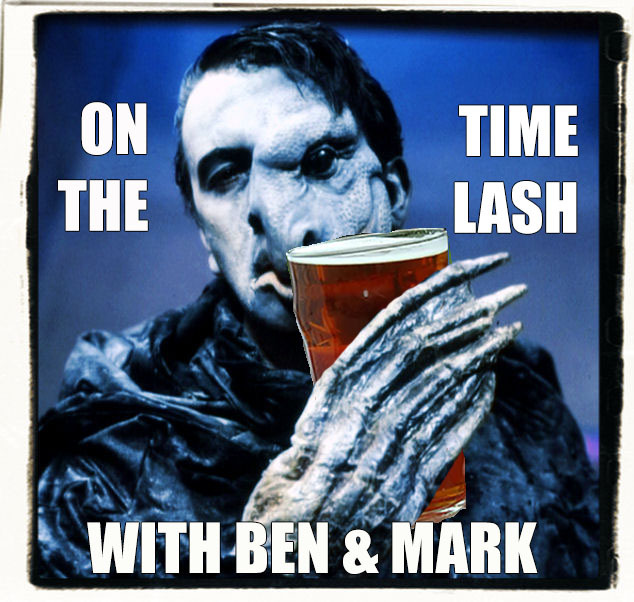 Ben and Mark discuss the second part of the Series 9 opener; The Witch's Familiar. What DID those titles mean? Also under discussion: Where did the Paradigm Daleks go? Davros' eyes, chairs and Mark sings a little Bobby Darin. Ben and Mark return after the Fringe to discuss Series 4 of 21st Century Doctor Who! THIS WEEK: It's Partners in Crime featuring the return of Catherine Tate as Donna Noble which they're pairing up with the return of another gobby companion; Tegan Jovanka in Arc of Infinity! Also: Mark Cousins! Jacques Brel! Amsterdam! Facial disfigurement! Colin Baker and Peter Capaldi! Giving it your all in a cleaner's cupboard. In the first of a weekly series, Ben and Mark discuss the newest episode of Doctor Who mere moments after airing. This week: The Magician's Apprentice. Also: The pressures of keeping secrets and BBC genre shows from the 1990s. Ben and Mark say goodbye for a month with a special episode all about holidays gone wrong as they discuss Voyage of the Damned and Delta and the Bannermen. The stories act as a springboard for discussions about star power, music, character deaths and love. We also discuss the recent Colin Baker/Doctor Who Magazine drama, and look back at another time the magazine fell foul of an actor from the show.